It looks like Amazon may have finally paid off all the requisite govt bureaucrats, because the Kindle Paperwhite and the Kindle Fire HD finally launched in China this morning. The Amazon.cn website was updated this morning with a huge ad on the homepage. 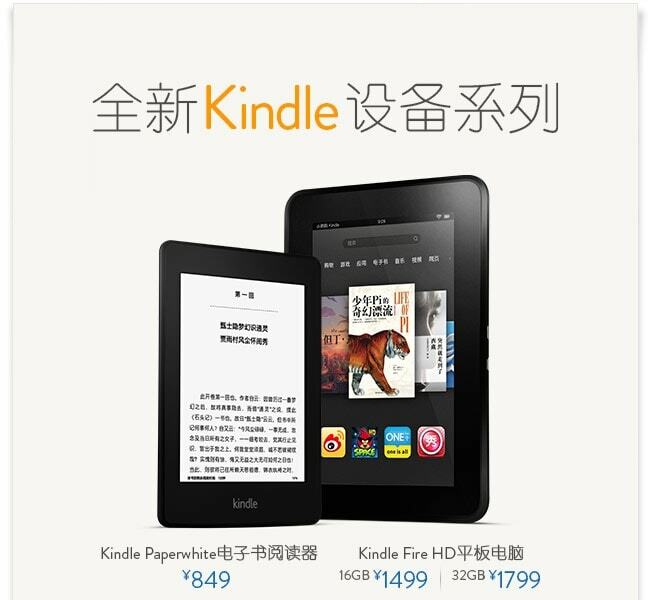 Amazon is now heavily promoting the Kindle Paperwhite, which is selling in China for 849 yuan (about $138 USD). The Kindle Fire HD is listed at 1499 yuan (~ $244 USD) for the 16GB model and 1799 yuan (~ $293 USD) for the 32GB model. The larger KFHD 8.9 isn't listed at the moment, which is puzzling given that the tablet had passed the necessary technical certifications. Today's launch follows just one month after Amazon launched the Amazon Appstore in China, and about 6 months after Amazon launched a local Chinese Kindle Store. This launch also comes as little surprise given the past rumors and the hints that Amazon dropped here and there. The user manual for the Paperwhite, for example, made it clear that Amazon planned to launch that ereader in China. Kindle Fire HD will have a tough time in any market, including China, where ti does not also support video, music (mp3) services. This is why its Canadian launch next week, for example, will be very muted. Devices like the year old Nexus 7 are much better value as they are open systems. This changes, of course, when Amazon launches those services in those markets.